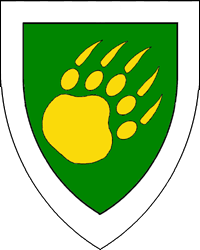 Vert, a bear's pawprint bendwise sinister Or within a bordure argent. Name registered with the College of Arms in March 2012. Device registered with the College of Arms in March 2012.